John Murray, London., 1812-1821. Various editions. Octavo. 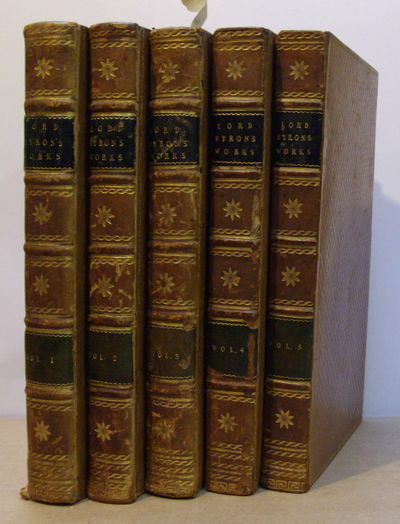 Five volumes, comprising:I. Childe Harold's Pilgrimage, A Romaunt: and Other Poems, 1812, pp xvi, 300.II. The Giaour, a Fragment of a Turkish Tale, 1814, ninth edition, pp [vi], 75; The Bride of Abydos, a Turkish Tale, 1813, fifth edition, pp [iv], 72; The Corsair, a Tale, 1814, second edition, pp xii, 100; Ode to Napoleon Buonaparte, 1814, third edition, pp 15.III. Lara, a Tale, 1814, 4th edition, pp 70; Fare Thee Well, a Sketch from Private Life, with other poems, 1816, first edition, pp 30; Childe Harold's Pilgrimage, Canto the Third, 1816, first edition, second issue, pp [iv], 79,  adverts; The Prisoner of Chillon, and other poems, 1816, first edition, later issue, pp [iv], 60; Manfred, a Dramatic Poem, 1817, first edition, later issue, pp 80.IV. 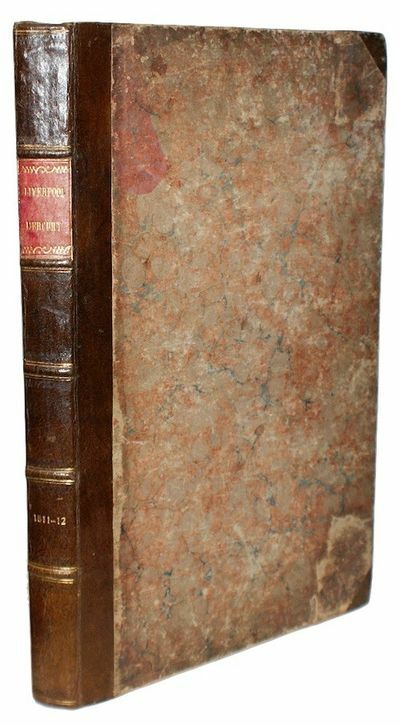 Childe Harold's Pilgrimage, Canto the Fourth, 1818, first edition, later issue, pp xvi, 257, Mazeppa, a Poem, 1819, first edition, second issue, pp 71.V. 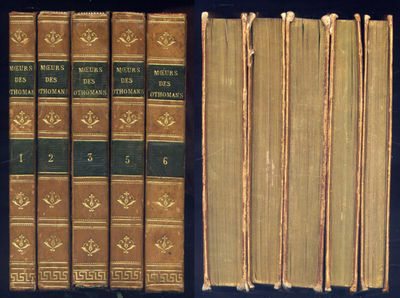 Marino Faliero, Doge of Venice, an Historical Tragedy, in five acts [and] The Prophecy of Dante, a Poem, 1821, first edition, later issue, pp xxii, 261.Period uniform bindings of full diced calf with raised bands, gilt decoration to spines and edges and covers, morocco title labels on spines. On each of the first four volumes is the bookplate of parliamentarian George Gunning of Horton (1763-1823).A bit of foxing to prelims of a couple of the volumes. Covers rubbed in places and one or two joints starting to split. A bit of insect damage to last few leaves of final volume. Very good set. Report from the Select Committee on Transportation. 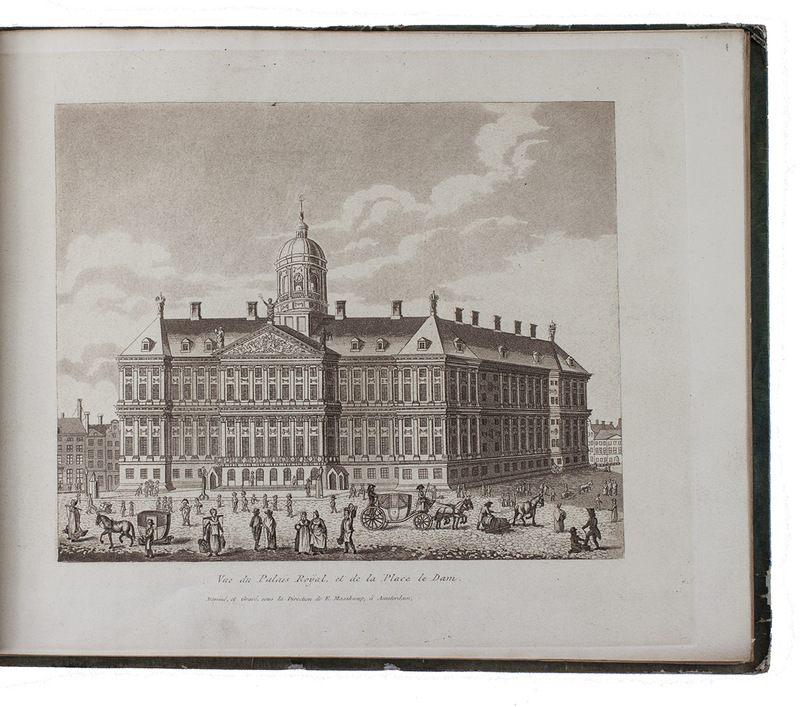 Liverpool: Printed by Egerton Smith and Co., 1812. 52 issues bound together. , viii, 90, 93-94, 91-92, 95-242, 245-246, 243-244, 247-416pp, xi, . Several leaves misbound. Later half-calf, marbled boards, contrasting morocco lettering-piece, gilt. Boards rubbed and a trifle worn. Occasional short marginal tears, spots of dust-soling, light browning. The Liverpool Mercury, 'conducted upon liberal yet steady principles', sought to convert the 'theoretic liberty' of the constitution - which had spawned newspapers that were merely 'vehicles of narrative' or 'engines of corrupt influence' - to the 'cause of moral and political truth in which all practical freedom is necessarily founded'. Admirable in its principles, the Mercury enjoyed an extensive run for a periodical of its kind, with the final issue appearing in November of 1904 when amalgamated with the Liverpool Daily Post. Each of the eight-page issues comprised two to three pages of, often attractively illustrated, advertisements, with the remainder devoted to domestic and foreign news, detailed reports on parliamentary proceedings and local trade, financial progression, the latest naval intelligence, original poetical works and, perhaps most notably, details of the individual trading-ships, many from the West Indies, that ploughed the transatlantic trade-routes. The 52 issues presented here represent the publication's first print year, of note is issue No. 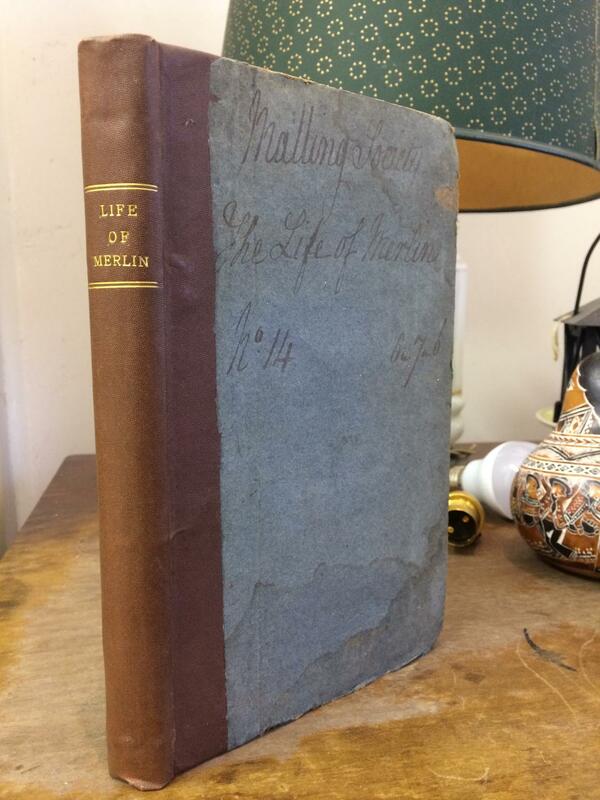 46 for May 15 1812, which provides a detailed account of the assassination by Francis Bellingham of Prime Minister Spencer Percival. . First edition. Folio. London: J. Nichols for W. Edwards. et al., 1812. 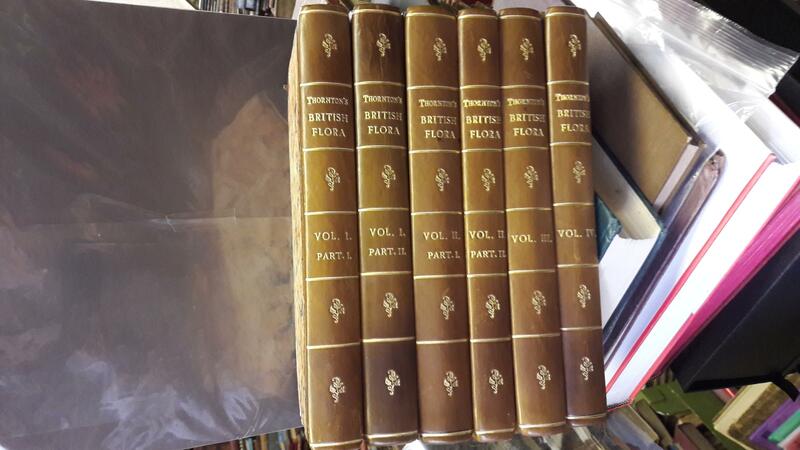 Second edition with many additions, corrections, map, and views of gentlemen's seats, antiquities, &c. Binding about fine, contents with bleeding from the plates as expected, else clean and sound. Second edition with many additions, corrections, map, and views of gentlemen's seats, antiquities, &c. Tall, thick quarto. vii, 530p. Illustrated with engravings in the text, a folding map, and 53 engraved plates, many in sepia tinted aquatint by S. Alken after J. Griffith, and 18 folding plates of pedigrees, facsimile signatures, etc.. Bound in later calf, the spine in 6 panels with red title label gilt and gilt floral panel ornaments, a.e.g. Säkularausgabe. 41 Bde. komplett inklusive aller Kommentarbde. und des Registerbdes. Herausgegeben von den Nationalen Forschungs- und Gedenkstätten der klassischen deutschen Literatur in Weimar und dem Centre National de la Recherche Scientifique in Paris. Bd. 1: Gedichte 1812 - 1827. Bd. 1KI: Gedichte 1812 - 1827 Kommentar. Bd. 1KII: Gedichte 1812 - 1827 Kommentar. Bd. 2: Gedichte 1827 - 1844 und Versepen. Bd. 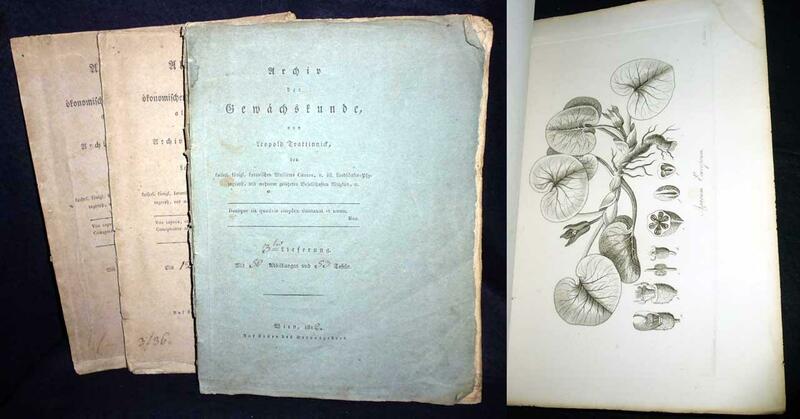 3: Gedichte 1845 - 1856. Bd. 4: Tragödien, frühe Prosa 1820 - 1831. Bd. 5: Reisebilder I 1824 - 1828. Bd. 6: Reisebilder II 1828 - 1831. Bd. 7: Über Frankreich 1831 - 1837. Bd. 7K: Über Frankreich 1931 - 1937 Kommentar. Bd. 8: Über Deutschland 1833 - 1836 Kunst und Philosophie. Bd. 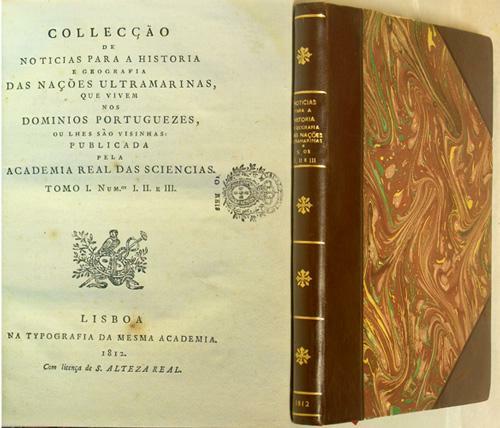 9: Prosa 1836 - 1840. Bd. 10: Pariser Berichte 1840 - 1848. Bd. 11: Lutezia. Berichte über Politik, Kunst und Volksleben. Bd. 12: Späte Prosa 1847 - 1856. Bd. 13: Poemes et Légendes. Bd. 13: Poemes et Légendes. Kommentar. Bd. 14: Tableaux de Voyage I. Bd. 15: Tableaux de Voyage II. Italie. Bd. 14/15K: Reisebilder. Tableaux de Voyage. Kommentar. Bd. 16: De l?Allemagne I. Bd. 17: De l?Allemagne II. Bd. 18: De la France. Bd. 19: Lutèce. Bd. 20: Briefe 1815 - 1831. Bd. 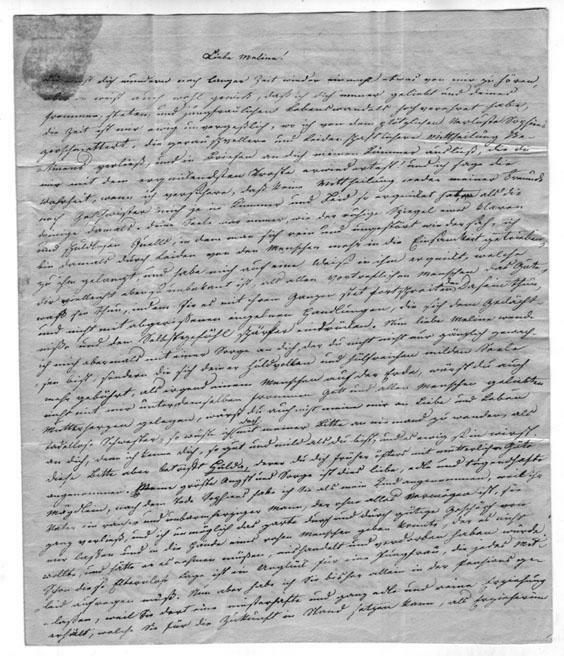 20K: Briefe 1815 - 1831 Kommentar. Bd. 21: Briefe 1831 - 1841. Bd. 21K: Briefe 1831 - 1841 Kommentar. Bd. 22: Briefe 1842 - 1849. Bd. 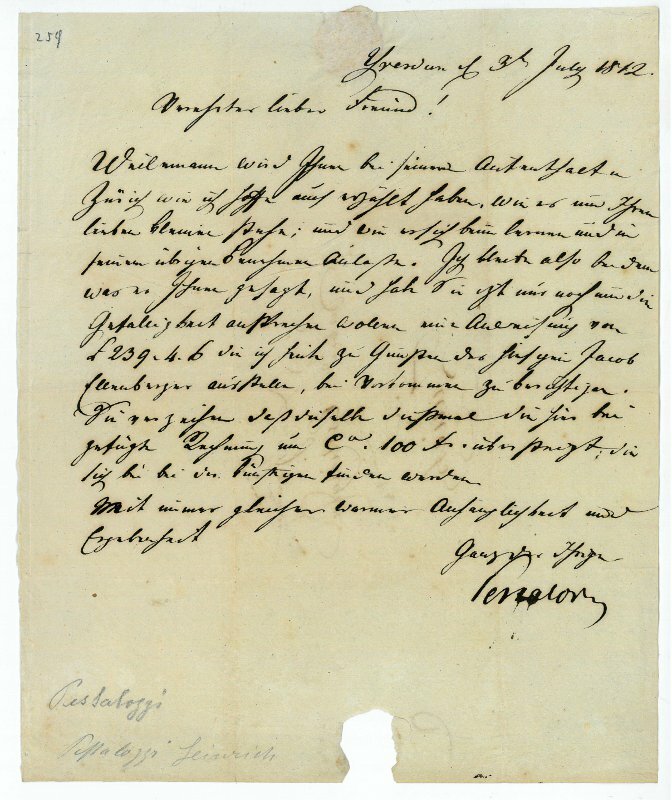 22K: Briefe 1842 - 1849 Kommentar. Bd. 23: Briefe 1850 - 1856. Bd. 23K: Briefe 1850 - 1856 Kommentar. Bd. 24: Briefe an Heine 1823 - 1836. Bd. 24K: Briefe an Heine 1823 - 1836 Kommentar. Bd. 25: Briefe an Heine 1837 - 1841. Bd. 25K: Briefe 1837 - 1841 Kommentar. Bd. 26: Briefe an Heine 1842 - 1851. Bd. 26K: Briefe an Heine 1842 - 1851 Kommentar. Bd. 27: Briefe an Heine 1852 - 1856. Bd. 27K: Briefe an Heine 1852 - 1856 Kommentar. Bd. 20-27R: Briefwechsel 1815 - 1856 Register. - Umschläge gebräunt mit kl. o. grösseren Randläsuren, vereinzelt auch Ausrissen, teils fleckig, angeschmutzt und/oder lichtrandig, Einband vereinzelt fleckig oder lichtrandig, Schnitte teils fleckig, Bll. und Vorsätze teils gebräunt, wenige mit Knickspuren, bei wenigen Bd. sind die Kapitalbändchen defekt. Insgesamt gute Exemplare. - Einzelverkauf der Bände ist ggfs. auch möglich. Bitte fragen Sie uns. Bungay: Brightly & Childs, 1812. 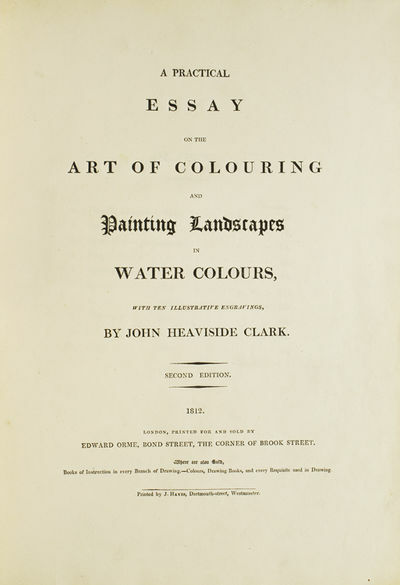 First Bungay edition, 4to, pp. xxxiii, , 927, ; engraved title page and frontispiece, 20 engraved hand-colored maps (3 folding), 28 engraved plates; Vancil, p. 18; bound with: A collection of the principal flags of all nations in the world, Bungay: Brightly and Childs, 1813; pp. , 15 hand-colored plates; together in full contemporary marbled calf recently rebacked, gilt-spine in 6 compartments, contemporary red morocco gilt-lettered spine label; extremities rubbed and worn, period ownership signatures "W. Robinson" and "J.W. Robinson Junr. "; textblock about fine. 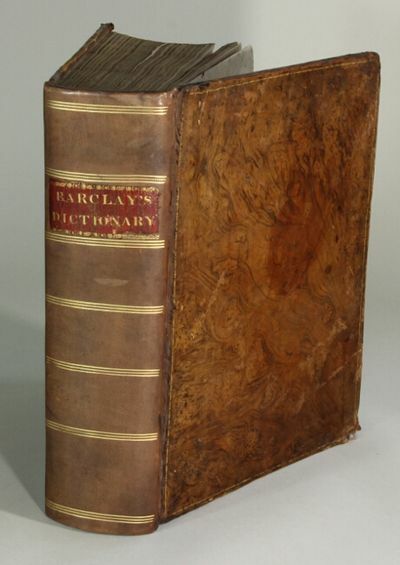 Barclay's dictionary includes a number of miscellaneous articles, including those on the origin of alphabets, by the Abbot Anselm, a short essay on the origin and antiquity of the English tongue, an English grammar, and sections on the constitution, government and trade of England. De penitiori structura cerebri hominis et brutorum. apud Cottam, 1812. In-folio (cm. 39), legatura recente in p. pelle con fregi in oro ai piatti e titolo in oro al dorso, tagli rossi; pp. XIV 354 con 6 tabelle f.t. (di cui due a doppia pagina ripiegate) e XV tavole illustrative in chiaroscuro ripetute poi al tratto (in tutto 30); grande vignetta in ovale al frontespizio di K.M. Ernst; alcuni segni alle prime due carte, sporadiche fioriture. Edizione originale del capolavoro dei due fratelli notomisti sulla struttura del cervello degli uomini e dei bruti. «Dimostrarono che il cervello è composto di globetti» [Sprengel. Storia prammatica della medicina. I, 187]. «Il bel lavoro dei fratelli Wenzel sul cervello sarà sempre una sorgente preziosa da cui attingere» [Carus. Trattato elementare di anatomia comparata. I, 32]. Esemplare molto buono. Vignettes de Shakspeare. 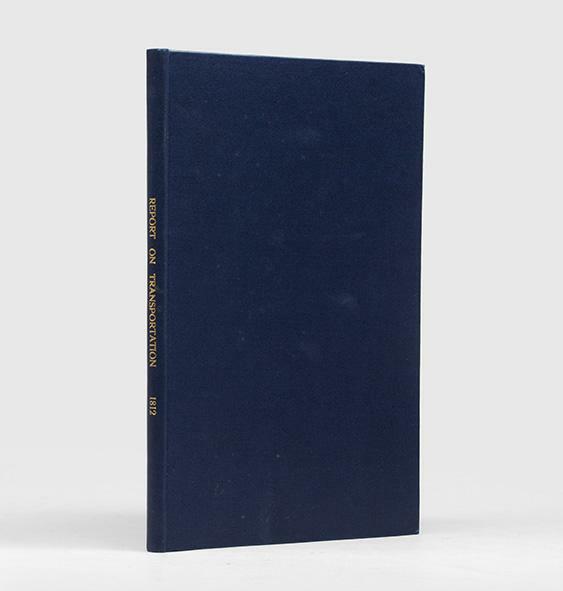 Published by Thomas Tegg. ELEMENTS OF BOTANY. 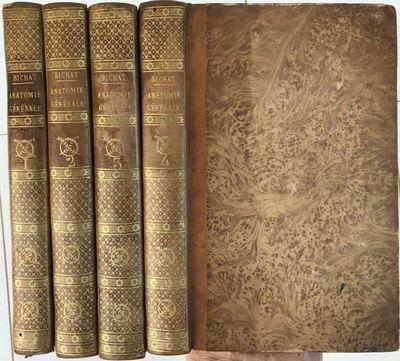 A Fine Set of 5 Volumes Bound in 6. P a r i s :  D é p o t   d e   l a   g u e r r e ,  1 8 1 2  Paris: Dépot de la guerre, 1812. . Contemporary marbled card board box. VG+. "The complete set of this copperplate engraved map, ca. 2000x3100mm., is compounded by 25 sheets of 422x575mm. ; scale 1:152.215; plates engraved by Franz (¿-? ), Carl Jäck (1763-1808), Heinrich Kliewer (fl. 1793-1840) and Carl Maré (1772-1835). Paulus Schmidt engraved Königsberg and Danzig beautiful plans, Meno Haas (1752-1833) the king Friedrich Wilhelm III portrait in the title plate, and the general map was engraved by Heinrich Kliewer in 1803.- // The set we offer has only 12 of 25 folding sheets (9th, 10th, and those from 15th to 24th), each compounded by 12 segments mounted in linen; all with the same provenance, and preserved with one of the blue marbled carton board box used by Charles Piquet (1771-1827) to supply composite maps to his customers.- // Sheet 9: Data updated to 1806; Sheet 10:  Jäck sculp. ; Sheet 15:  Angefangen v. Carl Jäck, 1806.- Vollendet v. Carl Mare, in Berlin 1809 ; Sheet 16:  C. Jäck, sculp. ; Sheet 17:  C: Mare Situat; Sc: Montes except: ; Sheet 18:  gestochen von C. Jäck Berlin, 1804. ; Sheet 19:  C. Mare Script: Sculp: . With population statistics from the year 1800; Sheet 20:  Franz. Sc: ; Sheet 21: no data (but Franz); Sheet 22:  Angefangen von Carl Jäck, 1806. ; Sheet 23: In Köningsberg plan: Grundriss der Haupt und Residenz Stadt Königsberg nach der neuen polizeilichen Eintheilung und den jetzt revirdirten Strassenbenennungen zussammengetragen im Jahr 1809. gestochen v: Paulus Schmidt in Berlin. ; Sheet 24:  General Tableau zur Karte von Alt-Ost= und Westpreussen nebst dem ausgenommenen Trigonomischen Netz, gestochen von Heinrich Kliewer, 1803. - // Very clean and white sheets, with the exceptions of an ink stain in the tip of the left lower segment of sheet 9; slight spots in sheet 10, and a small, faint stain on the lower tip of the last segment of sheet 15. One of the linen folds of sheet 18, semi-ripped. Board box scratched.- // Provenance. : From the Bibliotheque du Chateau de la Croix. François de la Grange exlibris over labels from  Charles Piquet, Geographe Graveur du Cabinet topographique de S.M. l Empereur et Roi, et se S.m. le Roi de Hollande.- // Refs. : Jäger, Prussia-Karten, pp. 195-226; Maps4u.lt, 33; Rumsey, 11178.000. The history of this von Schrötter s extraordinary map can not be more fascinating. As finance minister of West and East Prussia, he organized an immense survey between 1798 and 1802, to perform the maps corresponding to the territory annexioned to Prussia after the third partition of Poland, that of 1795. 1:50.000. On that basis a design on a scale three times smaller, little more than 1: 150.000, was made. Simon Schropp was responsible for recording this result, divided into 25 sections and and began its publication, in Berlin, in 1802(2). When the engrave, and impression of the map was yet running, the Napoleonic troops invaded Berlin in 1806 and hijacked the plates already engraved (14 complete and 4 in part), and the stocks of printed sheets. Although they wanted to sequester the original manuscript as well, Schropp was able to secure it  through Daniel Sotzmann, cartographer of the Berlin Academy and  evacuate it on an expedition that fledding the Napoleonic agentswith other artistic treasures. When Schropp recovered in 1809 the kidnapped plates(3), he organised the record of both the remaining and incomplete plates (remaking the title plate, and renaming 'Karte von Alt- Preussen as Karte von Ost-Preussen'), and the work was culminated before year ending. We think, although we can not be sure, that the leaves of this set were not printed in Berlin, but they are the equally rare issues printed in 1812 by the Dépòt de la guerre in Paris for restricted use. The area corresponding until 1795 to Lithuania, was collected in the leaves, 1, 2, 3, 6, 7, 11, 12 (all of them absent from this set), 17 and 18. In addition, Könisgberg, located on sheet 6 (absent from this set), has his detailed drawing on sheet 23. And Danzig, located on sheet 9, has his detailed drawing on sheet 8 (here absent). , Allgemeine Geographische Ephemeriden 2 (1798) Julius: 3-23. (2) Rasa Seibutyt:  Kleinlitauen auf den preußischen Karten des 18. Jahrhunderts , Annaberger Annalen 15 (2007): 89-113. (3) But he has to send 25 full sets of the map in change. For the kidnapping French version, see H.M.A. Berthaut: Les ingénieurs géographes militaires, 1624-1831: étude historique.- Paris: Impr. du service géographique, 1902, v. 2, p. 39-40, 58-59, 72 y 417. (4) These commentary is in debt both with Eckhard Jäger, and with the commentary about the map by Alexander Johnson, Antiquariat Dasa Pahor, Munich." Mesmerismus. Oder System der Wechselwirkungen, Theorie und Anwendung des thierischen Magnetismus als die allgemeine Heilkunde zur Erhaltung des Menschen. Herausgegeben von Karl Christian Wolfart. Mit gestoch. Aquatinta-Frontispiz und 6 (2 teilkolor.) gefalt. Kupfertafeln. LXXIV, 356 S. HLdr. d. Zt. Erste Ausgabe. - Hirsch-H. IV, 180 Waller 6506 Tischner, Mesmer 31 Graesse BMP 43. - Wolfart hatte Mesmer im Auftrag der preußischen Komission (unter Vorsitz Hufelands) 1812 in der Schweiz besucht und dabei die Manuskripte in deutscher und französischer Sprache erhalten (und übersetzt). Mesmer fasst "nochmals seine ganze Theorie zusammen und bringt auch noch in mehrfacher Hinsicht Neues ... Der erste Teil handelt von der Physik, worunter auch die Physiologie und sogar die Psychologie abgehandelt wird, der zweite Teil behandelt die Moral. Das Hauptstreben des Buches ist, alles möglichst mechanistisch zu erklären ..." (Tischner). - Ohne den 1815 erschienenen Erläuterungsband von Wolfart. - 5 der 6 Blatt Tafel-Trägerpapier beidseitig mit Marginalien von alter Hand in sauberer, gut leserlicher Schrift. - Gering berieben, insgesamt schönes Exemplar. London: Longman, Hurst, Rees, et al, 1812-83. Together 18 volumes, various 8vo sizes. Plates. 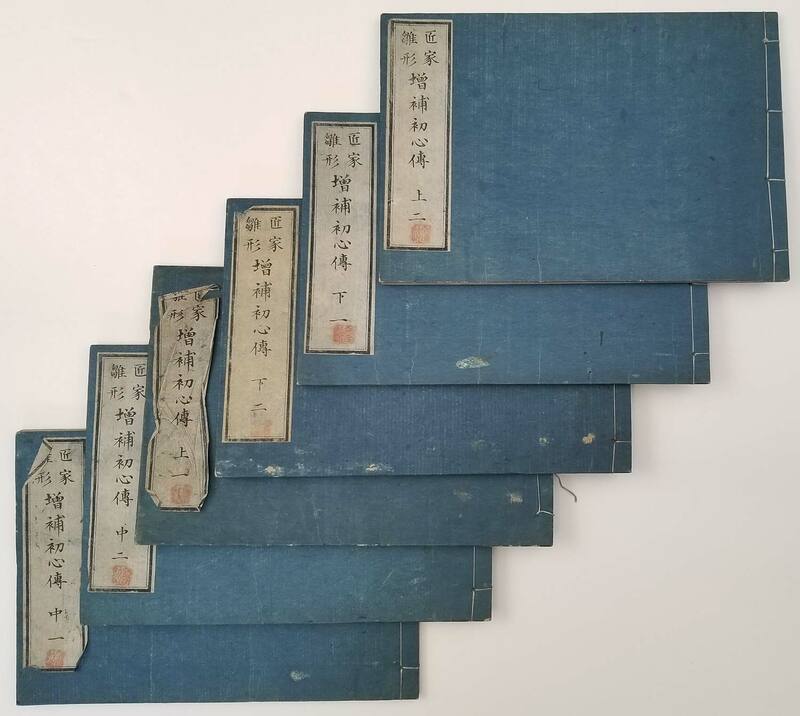 11 bound in modern half leather, 1 in library cloth, and 6 in original cloth. A very fine run of this important journal, with many notable contributions, including: COOPER, Sir Astley Paston (1768-1841). "A case of aneurism of the carotid artery". Vol. 1, pp. 1-12, 222-33. "Cooper ligated the common carotid artery on Nov. 1, 1805; the patient died, but a second case (June 22, 1808) proved successful" (Garrison-Morton-Norman 2929). DUNDAS, David. "An account of a peculiar disease of the heart". Vol 1, pp. 37-46. "Account of nine cases of rheumatic endocarditis" (Garrison-Morton-Norman 2739). ABERNETHY, John. "On a dimunition... of the area of the aperture by which the left auricle of the heart communicates with the ventricle of the same side". Vol. 1, pp. 27-36. Early report on mitral stenosis. TRAVERS, Benjamin (1783-1858). "A case of aneurism by anastomosis in the orbit, cured by the ligature of the common carotid artery". Vol. 2, pp. 1-16. Garrison-Morton-Norman 2931. PARKINSON, John William Keys (1785-1838). "Case of diseased appendix vermiformis". Vol. 3, pp. 57-58. "First case of appendicitis reported in English, and the first in which perforation was recognized as the cause of death" (Garrison-Morton-Norman 3560). STEVENS, William (1786-1868). "A case of aneurism of the gluteal artery, cured by tying the internal iliac". Vol. 5, pp. 422-34. First successful ligation of the internal iliac. Garrison-Morton-Norman 2935. BRODIE, Benjamin Collins (1783-1862). "Further observations on the diseases which affect the synovial membranes of joints". Vol. 5, pp. 239-54. In Medical Classics vol. 2. BLUNDELL, James (1790-1877). "Experiments on the transfusion of blood by the syringe". Vol. 9, pp. 56-92. "Blundell invented a syringe by means of which he was able to transfuse dogs" (Garrison-Morton-Norman 2015). BOSTOCK, John (1773-1846). "Case of periodical affection of the eyes and chest". Vol. 10, pp. 161-65. "Bostock's classical description of the 'catarrhus aestivus' hay fever, is also referred to as 'Bostock's catarrh'. It begins the modern era in the clinical recognition of hay fever. The case he described was in fact himself" (Garrison-Morton-Norman 2582). DAVIS, David Daniel (1777-1841). "An essay on the proximate cause of the disease called phlegmasia dolens". Vol. 12, pp. 419-60. "Davis was the first to state that phlegmasia alba dolens was due to inflammation of the veins. He was physician-accoucheur at the birth of Queen Victoria" (Garrison-Morton-Norman 6273). STAFFORD, Richard Anthony (1801-1854). "A case of enlargement from melanoid tumour of the prostate gland, in a child of five years of age". Vol. 22, pp. 218-21. "Sarcoma of the prostate was first recorded by Stafford" (Garrison-Morton-Norman 4259). NASMYTH, Alexander (1789-1849). "On the structure, physiology, and pathology of the persistent capsular investments and pulp of the tooth". Vol. 22, pp. 310-28. "'Nasmyth's membrane', or persistent dental capsule" (Garrison-Morton-Norman 3681). STANLEY, Edward (1793-1862). "A case of disease in the posterior columns of the spinal cord". Vol. 23, pp. 80-84. "Stanley was the first to describe disease of the posterior columns of the spinal cord" (Garrison-Morton-Norman 4525). BURTON, Henry (1799-1849). "On a remarkable effect upon the human gums produced by the absorption of lead". Vol. 23, pp. 63-79. "Burton was the first to note the blue line on the gums in lead poisoning - 'Burton's blue line' - an important diagnostic sign. He was physician to St. Thomas's Hospital, London" (Garrison-Morton-Norman 2099). CURLING, Thomas Blizard (1811-1888). "On acute ulceration of the duodenum, in cases of burn". Vol 25, pp. 260-81. "'Curling's ulcer'. Although not first to report duodenal ulcers as a complication of burns, Curling correlated the work of previous writers on the subject and directed attention to it" (Garrison-Morton-Norman 3445). MACINTYRE, William (1791-1857). "Case of mollities and fragilitas ossium". Vol. 33, pp. 211-32. Multiple myeloma first described. Garrison-Morton-Norman 4327. CURLING, Thomas Blizard (1811-1888). "Two cases of absence of the thyroid body and symmetrical swellings of fat tissue at the sides of the neck, connected with defective cerebral development". Vol 33, pp. 303-06. "Curling, of the London Hospital, was the first accurately to note the clinical picture of cretinism, which Ord was later to name 'myxedema'. Curling was also the first to suggest deficiency of the thyroid as a case of cretinism" (Garrison-Morton-Norman 3818). PAGET, Sir James (1814-1899). "On a form of chronic inflammation of bones (osteitis deformans)". Vol. 60, pp. 37-64; and vol. 65, pp. 225-36. "Paget was at one time Sergeant Surgeon to Queen Victoria. His classic description of osteitis deformans led that condition to be called 'Paget's disease'. Reprinted in Med. Classics, 1936, 1, 29-71" (Garrison-Morton-Norman 4343). ORD, William Miller (1834-1902). "On myxoedema". Vol. 61, pp. 57-78. Ord coined the term "myxedema" for the condition noted earlier by Curling and Gull. Garrison-Morton-Norman 3825. HUTCHINSON, Sir Jonathan (1828-1913). "On gangrenous eruptions in connection with vaccination and chickenpox". Vol. 65, pp. 1-12. Original description of varicella gangrenosa. Garrison-Morton-Norman 5439. PAGET, Sir James (1814-1899). "On a form of chronic inflammation of bones (osteitis deformans)". Vol. 60, pp. 37-64 and Vol. 65, pp. 225-36. His classic description of osteitis deformans led that condition to be called "Paget's disease". Garrison-Morton-Norman 4343. BARLOW, Sir Thomas (1845-1945). "On cases described as 'acute rickets' which are probably a combination of scurvy and rickets, the scurvy being an essential, and the rickets a variable, element". Vol. 66, pp. 159-219. "Classic description of infantile scurvy ('Barlow's disease'), which includes the pathology of the condition" (Garrison-Morton-Norman 3720). Also includes in vol. 7: Brodie, G-M-N 2994; Guthrie G-M-N 2937; and G-M-N 2938. And in vol. 8: Langstaff, G-M-N 4258. Cloth bindings reinforced with tape, occasional chipping and soiling, occasional library markings, overall in very good condition. Ueber altdeutsche Architektur und deren Ursprung. Archiv der Gewächskunde. 1.-3. [v. 5] Lieferung. Influence or Prerogative? Being an Attempt to Remove Certain..
, 1812. 1812. 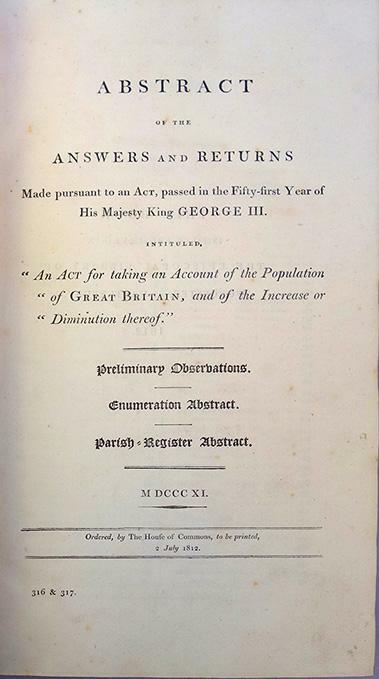 Scarce Essay on the English Constitution Advocating a Greater Degree of Royal Influence Twiss, Horace [1787-1849]. Influence or Prerogative? Being an Attempt to Remove Certain Popular Misconceptions Respecting the Present State of the British Constitution and Government. 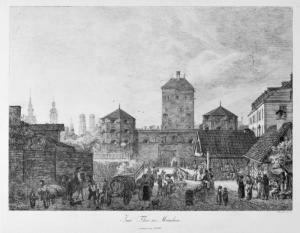 London: Printed for J. Hatchard, 1812. 94 pp. Octavo (8-1/4" x 5"). Stab-stitched pamphlet bound into recent stiff wrappers, printed paper title label to front cover. Some toning, light foxing to a few leaves, light soiling to title page and verso of final leaf. "The Lord Viscount Palmerston with the Author's Compliments" to head of title page, interior otherwise clean. $500. * Only edition. A presentation copy to Lord Palmerston. 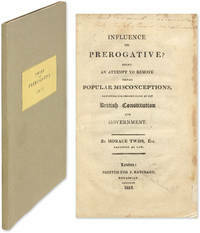 The author defends the influence of the Crown in the scheme of British Parliamentary government; without it the Prerogative would have to be revived. In his conservative view of the constitution and its core concept of checks and balances, the increasing influence of the Crown is indicative of the growing power of Commons and consequently the need to maintain equilibrium. Twiss was called to the bar in 1811 and later served as King's Counsel. As an author he is remembered for his life of Lord Eldon and for a number of literary works. This is his first publication relating to the law. OCLC locates 2 copies in North America, neither in law libraries. Not in Sweet & Maxwell. Collection of 13 aquatint views of Amsterdam].Amsterdam, Evert Maaskamp, [ca. 1826]. Oblong 4to (21 x 25 cm). With 13 sepia aquatint plates (image size ca. 15.5 x 19 cm). Contemporary green boards. - Cf. Landwehr, Coloured plates 365 and 452. Charming collection of 13 sepia aquatint plates with views of Amsterdam, published by Evert Maaskamp. They include the Royal Palace (interior and exterior), the stained glass windows of the Oude Kerk, a theatre, a concert at the Felix Meritis and several views of Amsterdam's famous canals. All but the last plate were also issued by Maaskamp in 4 instalments with a letterpress title-page, Nouvelle statistique historique d'Amsterdam, each instalment accompanied by 8 pages of text, dated 1812 by Landwehr. At least the present series appears to be later, for the laid paper tissue guards, from a single paper stock, match one from 1826 (Voorn, Noord-Holland 184). With bookplate on paste-down. One plate with a marginal water stain, not affecting the image, some occasional offsetting on the tissue guards and the back of previous plates, some other plates slightly stained in the margins, but otherwise in very good condition. Binding worn along the extremities. Récapitulation de toute la Maçonnerie ou description et explication de l'hiéroglyphe universel du Maître des Maîtres. Orient de Memphis XXXVIIIMDCLXXXXII. (Paris), imp. de Nouzou, (1812), in 8°, de 47pp., 2 planches gravées sur acier h.t., cart. moderne papier marbré genre ancien, pièce de titre triangulaire et étiquette dorée "Charlesworth Masonic Library" au 1er plat, rousseurs. Très rare. L'auteur décrit "l'hiéroglyphe universel qui appartient à un grade inconnu en France", qui a la forme d'un triangle équilatéral divisé en 9 petits équilatères égaux, 3 d'entre eux occupant les 3 angles du grand triangle, l'espace entre eux formant un hexagone régulier, un cercle étant inscrit au centre de cet hexagone, formé par la houppe dentelée nouée de 81 noeuds, le grand hiéroglyphe de la nature étant tracé à l'intérieur de ce cercle. La description et l'explication de tous les symboles contenus dans cet "hiéroglyphe universel" forment le contenu de cet ouvrage recherché. ¶ Caillet 2909 - Fesch col. 463 - Dorbon 1123 : "Très rare." - Wolfstieg 31998 - Kloss 1986 - Ouvaroff 320. Pestalozzi, Johann Heinrich, Swiss pedagogue and educational reformer (1746-1827). Yverdon, 3. VII. 1812. - 4to. 1 page. Unpublished letter to the Zurich merchand David Esslinger, on business matters. - Small damage to edges, traces of folding. Anatomie generale, appliquee a la physiologie et a la medecine. JAPAN - ARCHITECTURE) Ishikawa, JuÌ&#132;ho. ç&#159; å &#157;é&#135;&#141;ç"«. London: 1804 - 1812 - Sheet Dimension: 22 x 18 in. Hand-colored aquatint engraving. Brookshaw&#146;s fine illustrations make excellent use of the rich, modulated tones that the aquatint process creates. The elegantly arranged and richly colored fruits emerge from deep brown backgrounds or float on a softly mottled light ground, creating a presence unlike that of any other botanical illustrations. Brookshaw asserts in the preface that the Pomona Britannica was an enduring work created for the enjoyment and edification of &#147;succeeding generations.&#148; The beauty and uniqueness of his illustrations guarantees the lasting value of this most exceptional work. Abstract of the answers and returns made pursuant to an act . . . intituled, "An act for taking an account of the population of Great Britain, and of the increase or diminution thereof"
London: Printed for R. Ackermann, 101, Strand, by L. Harrison and J. C. Leigh, 373, Strand, M.DCCC.XII. . First Edition. Half-Morocco. Near Fine+. Large 4to's: xviii,330,; ,275,pp, with 80 hand-colored aquatint plates of stained glass, mosaics, tombs, monuments and architectural details; one hand-colored line engraving; a plan of the church, and an uncolored engraved portrait of William Vincent. Complete with both half titles and list of subscribers, with text by William Combe and plates after F. Mackenzie, A. Pugin, and others. Bound in dark green half-morocco over marbled paper-covered boards, spine in five compartments (two framed and decorated in gilt, three lettered direct in gilt) between raised bands paneled in gilt, matching marbled end papers, all edges gilt. An excellent, square set, beautifully bound, boards lightly rubbed, several quires foxed or toned, virtually all plates offset onto opposing pages (a few heavily so), else a bright, wide-margined example. Martin Hardie, p. 103-04. Abbey, Scenery, 213 and 214. Tooley 2. Adams 108. Prideaux, p. 331. 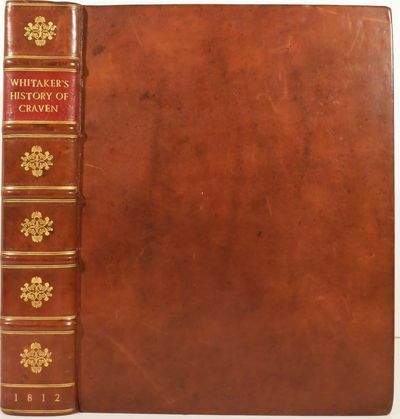 First Issue (with first plate in v. 2, Aymer de Valance, signed in error "F. Mackenzie" instead of "A. Pugin.") 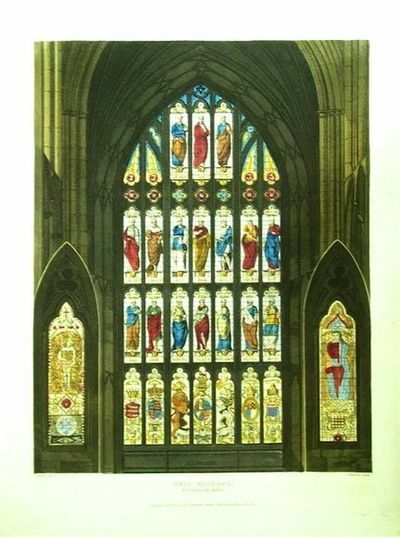 "A book that should be highly rated both as an exhaustive pictorial record of the Abbey and for its individual architectural plates, beautifully composed and aquatinted with the addition of discreet colour just sufficient to suggest the cloistered intimacy of sunlight filtered by lofty windows onto fretted stone, wood and metal" (Adams). "[I]ntended as a 'companion and continuation of the Microcosm of London.' Originally published in sixteen monthly numbers . . . When it was completed, [Ackermann] had all the original drawings bound up with the letterpress and mounted on vellum, making a unique copy." (Hardie) Note: With few exceptions (always identified), we only stock books in exceptional condition. All orders are packaged with care and posted promptly. Satisfaction guaranteed. Paris, Nepveu, Libraire, 1812. Cinco volúmenes en 12vo. (13 x 8 cms. ); 180 pp., 2 hs. mas 2 hs., 226 pp., 1 h. mas 2 hs., 252 pp. mas 2 hs., 232 pp. mas 2 hs., 235 pp. Con 54 bellísimas láminas coloreadas de época. Cintas de lectura en cada volúmen. Encuadernación de época, en piel habana, con ruedas doradas en planos y contraplanos, lomera ornada, tejuelos y cortes dorados. DOMENICO QUAGLIO (1787 - 1837). Isar Thor zu München, erbaut um 1310". Reich staffagierte Ansicht von der Außenseite mit dem ehemaligen alten Wehrgang, rechts vorne noch die alten Torwach- und Militärhäuser in der Ferne die Türme der Peters- und Frauenkirche.